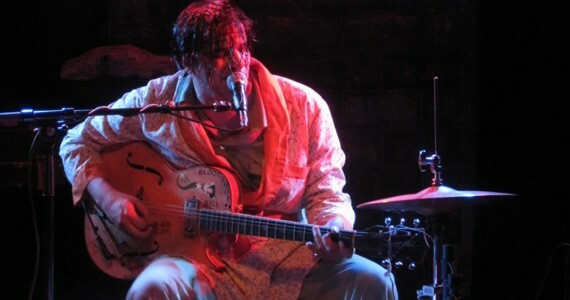 With a custom-made Richtone amp, one-man-rockabilly-band Bloodshot Bill is a pastiche of smoky dance halls, grain-mash bourbon and monochrome broadcasts. Touring the world for about 15 years, the prolific Montrealer keeps taking us back to the era of American music that mixed southern railway songs with the pomade pompadours of post-war sexual and social rebellion. Playing the rustier strings of Charlie Feathers, Hasil Adkins and Carl Perkins, Bloodshot Bill is a blue suede shoe of nostalgia, attracted to the showmanship of early rock 'n' roll. "There is a 'they don't make 'em like that anymore' angle to it," Bill says, "But really I just love the stuff that came out during that period. I'm not talking about a way of life or anything. I wasn't there and I don't pretend to be. But, beyond the music, it just seems there was an emphasis on style that was put into everything. And the music, to me, is just the best there is. It's downhill from there." An avid record collector himself, he has already released a 10-inch, a seven-inch and seven-inch-split this year, from which he might play on Thursday at The Bus Stop Theatre. Halifax welcomed Bill with a car/gear jacking in 2003. "It happened behind the Marquee, right across from the police station. [I'm] glad to come back, but still kinda curious where my guitars are." For a man who's toured 49 states, was banned from America for five years and has his own line of hair wax called Nice 'N' Greasy, what's a little grand theft auto? That's just the life of a one-man band. "I don't get lonely," he says. "I actually like it."